Recently I have been on the hunt for "comfy cas(ual)" clothes. It's casual! (sorry inside jokes over here). Being a college student, sometimes it's difficult to look super put together everyday. However, I am one of those students who loves to dress nicely to class each day. But that is not possible every day, especially with early classes and super long days in the library. I remember last semester I would generally look nice Monday Wednesday Friday (when I had a 9:30) and would roll out of bed for my 8:30 on Tuesday and Thursday. I know I know, 8:30 doesn't seem that early, but when you're a college student anything before 9:00 just seems undoable. I occasionally would look decent on these days, but I never had clothes that were just casual. For me it was either leggings, sweatshirt, and tennis shoes or dressy clothes. 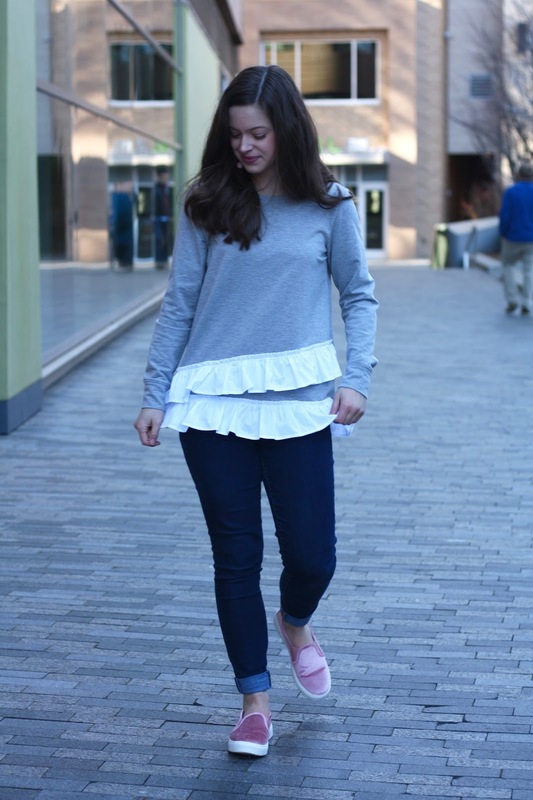 That's why this semester I decided to invest in more loungewear style clothes, and also sweatshirt style shirts with a twist (such as this ruffled number!). That's where this outfit comes in, a casual outfit (in my book) that is comfortable and suitable for daily college life. I know that this might not be casual to some, but I found this outfit to be incredibly comfy and this shirt so so soft. Enjoy! This ruffle sweater is from TJ Maxx and an absolute steal. I've seen versions of these easily go past $40, and this one was only $18. It has a thicker material than a regular t-shirt, so somewhat of a sweatshirt style, so it is perfect for the colder months. I also wore my comfiest pair of Gap Jeans. I've worn this outfit in other variations, such as with booties and a cute coat. So many options with this trendy shirt, which is somewhat unexpected. With minimal hair and makeup, I decided to throw on these pink bauble earrings. I know these aren't necessarily casual, but adding statement earrings is an easy and surefire way to make your outfit look like you put way more effort into than you actually did. I hope you all enjoyed my version of a casual outfit. Sometimes casual clothes are so hard to find, but especially when it seems like everyone has super adorable loungewear and you just cannot find any! What has been your go-to brand for casual clothes, and what is your go-to look around campus?